Emilio Estevez hasn't just been making wine lately. His film The Way, an inspirational drama, is a thoughtful travel pic worth seeing. While some might believe Emilio Estevez has faded quietly into the background (aka directing TV and making wine), in actuality, he has quietly been working on The Way, an inspirational drama about a father making a spiritual journey after his only son is killed. There is no doubt, after watching this delicate “family affair” of a film, that it was a labor of love for Estevez. Not only did he direct and star in it, but he also wrote the script (based on stories from Jack Hitt’s travel journal ‘Off The Road’). 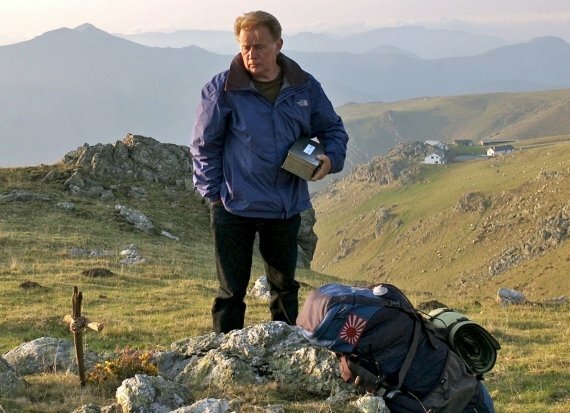 Martin Sheen (real-life father of Estevez) plays a wealthy eye-doctor who discovers his grown son has been killed while on the El Camino de Santiago, also called The Way of St. James. The Way is an ancient path that starts in France and ends in Spain, and pilgrims have been traveling on it for centuries. When Tom (Sheen) discovers that Daniel (Estevez) was killed by the elements his first night out on the pilgrim’s path, he flies to France to retrieve his son’s body. While breathing in the effects of the cold European climate, Tom begins to have a glimpse into his son’s life. Tom never understood Daniel’s free spirit, and the two were often at odds and distant. But after seeing his son’s body and trying to deal with his grief, Tom decides to take Daniel’s gear and travel The Way for him, scattering his ashes all along the journey. This leads to plenty of introspection, self-discovery, and unlikely friendships, as the 60-something-year-old Tom takes his gruff self down the path toward Spain. Along the way he meets a bitter chain smoker from Canada named Sarah (Deborah Kara Unger), an over-weight Dutchman named Joost (Yorick van Wageningen) and a pretentious Irish writer named Jack (James Nesbitt). Estevez’ direction isn’t bad. He takes advantage of the gorgeous scenery (The Way was filmed on location in France and Spain) with plenty of wide shots and slow pans. The audience also gets the picture of “life is a journey” with the help of slow, far-away shots of lone travelers (Tom) or clusters of travelers walking along the path at different points. These scenes sometimes go on too long, but they also build up the metaphor of the film. Estevez also employs flashbacks, which do a good job of establishing Tom’s relationship with Daniel. Daniel pops up in the present from time to time as Tom travels along the way. These “ghosts” or visions are a touching addition, helping to bring some closure to the father/son relationship from both perspectives. The spiritual aspects of the story aren’t heavy-handed, though it’s most definitely a spiritual journey that Tom takes. Religious aspects of The Way are unavoidable, as the path was for religious pilgrims originally and leads to the ending point which is a famed cathedral and Christian hotspot. That being said, it’s not a religious journey so much as an emotional and spiritual one, reinforced by Tom’s own “lapsed Catholic” beliefs. The story does drag in parts, and the script is by no means perfect. It’s the subtleties of the story, and the careful way the religious aspects were handled, that makes the story of Tom’s journey for his son so remarkable. There is also some effective humor, particularly in Joost’s character, that keeps what are sometime weighty matters in perspective. Sheen is a remarkable actor, and even at his age he can still handle nuance and hasn’t become the one-note actor some iconic thespians have. His Tom is nearly unlikable at the beginning of the movie, but I think this is more because of how the character was written than any failing on Sheen’s acting ability. Supporting characters excelled, particularly Wageningen. His happy-go-lucky Dutchman with a weight problem was one of the funniest characters, and the most likeable. And Wageningen didn’t just rely on his innate comedic presence to sell the role, he also had some subtle depth and took on a few of the more emotionally heavy moments with fearless authenticity. Unger scared me. Her performance was above board, but the sheer frailty of her physical presence made me afraid for her life. Less believable than a chain-smoker making it across two countries on foot was the idea of someone as emaciated as she was doing it. I wasn’t a fan of the soundtrack. Sometimes old-timey folk songs filled the immensity of the European hillsides, sometimes light orchestral scores. All in all, it was definitely the sparse but targeted dialogue, the touching spiritual journey, and the authentic settings that sold The Way. 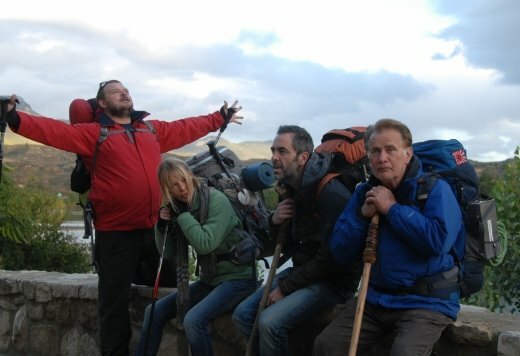 Each person travels the camino for reasons of their own, and the film delves lightly into the supporting characters’ motivations but maintains a “the journey is the destination” kind of philosophy. That, paired with a few touching moments of religious reverence and relationship revelations, makes for a touching drama/adventure pic that’s worth a thoughtful watch.